1. Mobile is more important than ever. What does this mean for dental marketing? If your practice doesn’t currently have a responsive website, that should be priority #1 for your 2019 strategy. However, if you DO currently have a responsive website, evaluate if it’s still performing the way it should – in other words, is it consistently delivering new patients? Is it performing well on search engines? If not, it might be time for a new website and a fresh SEO strategy for the new year. 2. Dentists MUST optimize for local search. 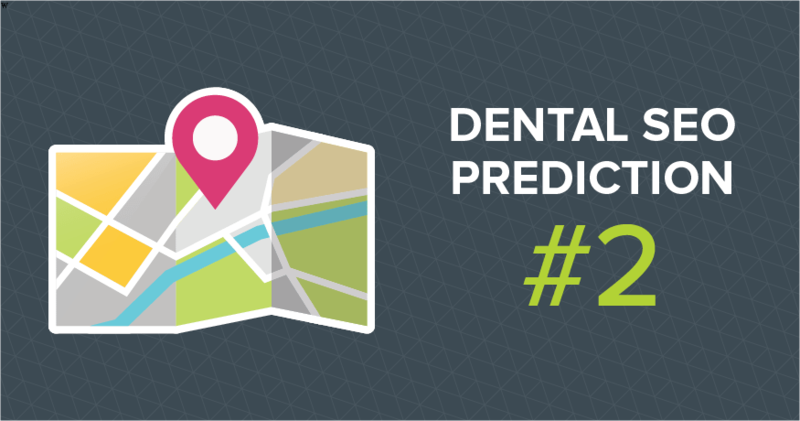 When people in your community search for a dentist, their intent is typically to find results nearby (ex. Dentist near me). Dentists and orthodontists who prioritize optimizing their Google My Business information will see improved local search results. 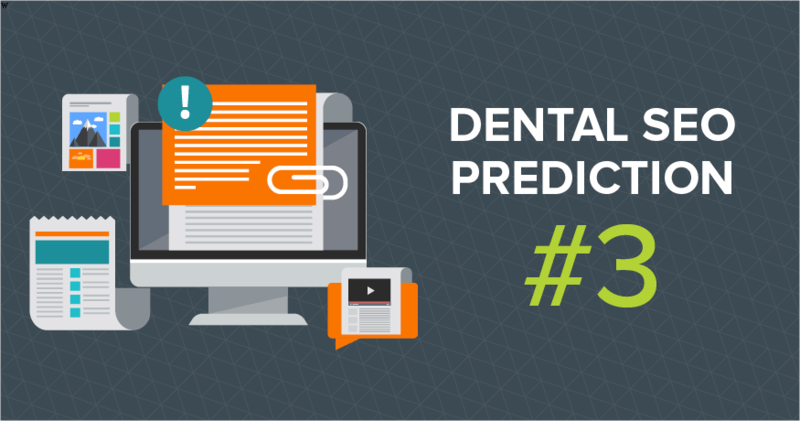 The importance of local search optimization for dentists will only continue to rise, which is why it’s one of our dental SEO predictions for 2019. How can you ensure your practice is optimized properly for local search? Make sure you’ve verified and optimized your Google My Business profile. Prioritize getting reviews on Google and other review sites. What do reviews have to do with local search? A business with plenty of positive reviews signals to Google that it’s a legitimate, relevant, and useful choice for the searcher – resulting in higher rankings. 3. High-quality content will continue to be crucial to get to the top. This may not seem like an earth-shattering SEO prediction, but the truth is that well-written, purposeful, educational content will continue to be important for rankings. Dentists and orthodontists particularly have a lot of opportunities to educate through quality content on their websites, blogs, and in lead-generation downloads, like ebooks. Stuck for content ideas? Think about the top three questions your patients ask about a particular service. Boom! There’s a blog post. What do patients need to know before coming to the office for their first appointment? Boom! There’s a lead-gen ebook. In other words, share what you know will be useful and helpful to your patients on a regular basis and it will have an ongoing positive effect on your rankings. 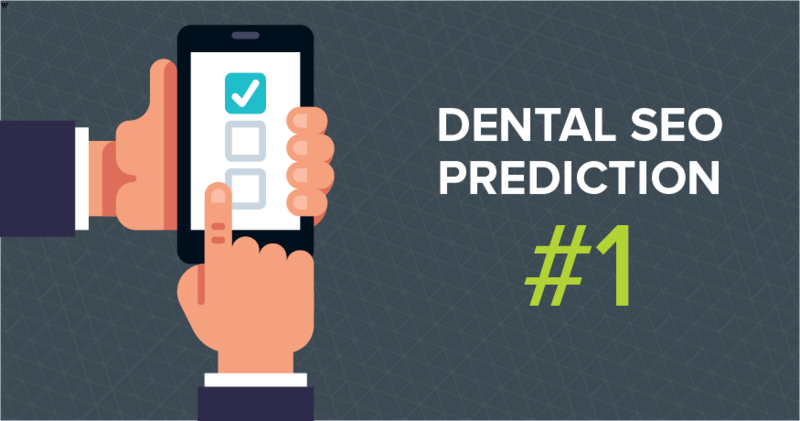 In conclusion, these three dental SEO predictions underscore what you might already know to be true: A well-rounded strategy includes prioritizing mobile, optimizing for local search and getting reviews, and continually creating quality content. Need any assistance planning your 2019 dental SEO strategy? We’re here to help. Call Angela at (360) 283-5001 to discuss how Roadside can help your practice have its best year yet!